Over 70 members and guests attended the Dumfriesshire and Galloway Natural History and Antiquarian Society's annual James Williams Memorial lecture on 2 December 2016 to hear Dr John Reid of the Trimontium Trust speak on The Roman Assault on Burnswark Hill: A Conflict Rehabilitated. Dr Reid described the Iron Age hillfort at Burnswark near Ecclefechan, sandwiched between two Roman camps on the north and south sides. The South Camp had significantly stronger defences on its north side facing the hillfort, and three large gateways, fronted by three mounds — the so-called Three Brethren. The North Camp was distinctly and unusually elongated and was twice the distance from the hillfort rampart on the north side than the South Camp was from the south side of the hillfort. The earliest archaeological reports of the site concluded that a siege had taken place, taking account of finds of sling-bullets, arrow heads and a Roman sword from the site. That view prevailed until 1964, when an alternative interpretation was put forward that the hillfort had been used as a practice range by the Roman Army. This theory was subsequently generally adopted and presented in popular publications on the Roman Army in Scotland. However, more recently archaeologists and historians have challenged this theory, pointing out that no other 'practice camps' have been found in the Roman Empire. They have also queried why the two Burnswark camps are so irregularly shaped? Why are their two? Why were the Romans practising in enemy territory? Why did they need to practise at all? 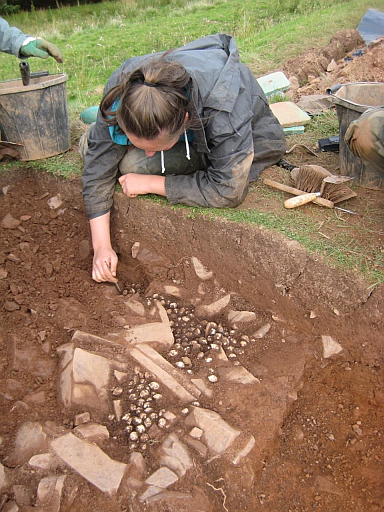 The issue remained unresolved and the Burnswark question has been identified as one of the key research topics in the future study of Roman Scotland. Dr Reid went on to describe the current research project directed by himself and Andy Nicholson, Dumfries and Galloway Council's Archaeologist. In 2013 the hillfort was surveyed using sophisticated metal-detectors, in the same way that they have been used over battlefield sites such as Culloden. The detectors used can differentiate between metals and have been be employed to identify the spread of Roman Army lead sling-bullets over the site, without having to dig them up. The survey recorded large quantities of lead signals which were identified as probable sling-bullets. In the exploratory excavations undertaken in 2015, two trenches were placed over concentrations of lead signals and of the 18 lead targets detected, 17 proved to be Roman lead sling bullets. Two types of bullet were found — a 'lemon'-shaped bullet and an 'acorn'-shaped bullet, unique to Roman sites at the west end of Hadrian's Wall and both weighing about 60 gm. Subsequently a third type was recognised, having a 4 mm diameter hole drilled to 5 mm depth. When slung these make a whistling noise and were intended to induce fear amongst those being targeted — an early example of psychological warfare. The excavations also found several stone 'ballista' balls and a possible iron point, fired up at the rampart along with the sling bullets. Overall 670 lead sling bullets have been detected over the whole site, with concentrated distributions along the south rampart of the hillfort and behind the north rampart of the South Camp where they had been dropped. Further excavations were carried out in August 2016. Two trenches were opened in the South Camp, both behind the north rampart facing the hillfort, and one trench in in the North Camp. All three were placed over concentrations of metal-detected lead and other metal signals. One of the main objectives of the work was to establish whether or not the two camps were in use at the same time. In the South Camp, in one trench, one sling bullet was found — the rest of the signals were modern bullets — but in the other trench, a large cluster of Roman bullets was found. 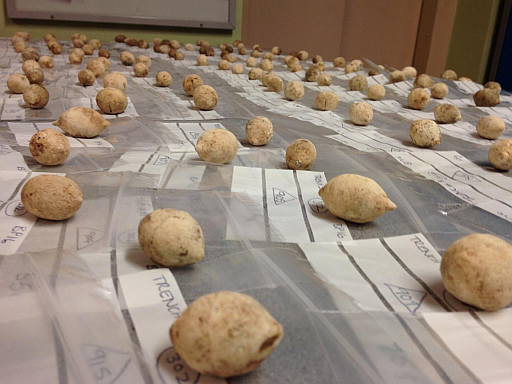 In the North Camp, an even larger cluster was found with a total weight of 15 kg — the largest collection of sling bullets from any site in the Roman Empire. Dr Reid pointed out that abandoned munitions were often seen in the aftermath of modern-day conflicts. Sling-bullets from the North and South Camps appear to be identical and are currently undergoing lead isotope analysis in the Goethe University in Frankfurt. Analysis of previous samples from the site and from other sites in Northern England and Scotland appear to indicate that the lead used comes from a common source near Mainz in Germany, particularly the lead used in the making of the 'acorn'-shaped bullets. The current research project suggests that the irregularly shaped camps were a pragmatic and tactical response to the local terrain and the potential enemy threat, and occupied at the same time. It indicates that the hillfort's south rampart was subjected to a barrage of missiles along a 500m-wide front. Such a barrage must have provided suppressive fire to allow a direct assault on the ramparts by the Roman Army, and indicates a high degree of force directed against the hillfort's defenders, perhaps in an exemplary way. When did this happen? Three 'acorn' bullets from the nearby Roman fort at Birrens are dated, by association with other finds, to the late Hadrianic–early Antonine period (about 130–145). The Roman Emperor Antoninus Pius's invasion of Scotland was conducted by his general Lollius Urbicus, a veteran of the Third Jewish War, 132–136 AD. He went on to serve as Governor in Southern Germany in 137–138, with the VIII and XXII legions. From 138–142 he was Governor of Britain and brought with him detachments or vexillations of the VIII and XXII legions. Inscriptions from Birrens show that these units were based there. The Burnswark research project is now beginning to suggest that the assault on the hillfort marked the opening of the Roman invasion of Scotland ordered by Antoninus Pius. The Roman Army then moved north through the western Lowlands to build the Antonine Wall across central Scotland in 142, thereby marking the new northern limit of the Roman Empire. Recent research on fragments of an inscription found at Birrens fort, suggests that the largest 'Victory' monument found in Roman Britain was erected there to record this achievement.